Teachers participating in the ACE program in the seven schools (Aishling Tews at Bishop McDevitt HS in Wyncote, John Huber at The Wyndcroft School in Pottstown, Joanna Rouse at Pennridge HS, in Perkasie, Ellen Conrad at Independence Middle School in Bethel Park, Dave Schaffer at Springhouse Middle School in Allentown, Sandra Gilmore of Danville HS in Danville, and Zee Ann Poerio at St. Louise de Marillac School in Upper St. Clair) each received three (3) ancient Roman coins and one (1) Byzantine coin that can be used as awards or door prizes for events. Some schools will use the coins for student contests or fund raisers for their Latin Clubs. Some will use the coins as door prizes where the winner can "take an Emperor home" with them after an open house to promote numismatics. Others will use the coins as awards for students whose participation in the ACE program sparked an interest in numismatics. PAN was introduced to ACE two years ago when the first School Ancient Coin Museum was established in Pittsburgh by Zee Ann Poerio of St. Louise de Marillac School. Poerio is Vice-Chair of the ETC (Excellence Through Classics) committee of the ACL (American Classical League) and organized the museum as a way to introduce students to Classical studies through Ancient coins. Richard Gaetano,a PAN member, visited St. Louise de Marillac school on several occasions to speak to students about coin collecting in general. Gaetano also donated coin display cases, books, and other items and was a speaker at the first coin museum event. Mr. Homren contributed coins, books, and materials to the first museum exhibit for a section on modern coins to show the connection to ancient coins. PAN also donated "loot bags" for children who attended the ancient coin museum exhibits that were open to the public and also provided materials for teacher workshops. ACE is especially grateful to Don Carlucci, PAN Chairman of the Board, Kathy Sarosi, PAN President, and all the PAN members for supporting the Pennsylvania schools and helping to promote numismatics through coins and Classics. This partnership with PAN is one way that numismatic groups can reach out to the community, offer educational support, and promote their hobby. http://www.pancoins.org/ Pennsylvania Association of Numismatists (PAN) is a non-profit educational organization founded in 1978. It is an organization consisting of individuals and coin clubs from throughout the Commonwealth. 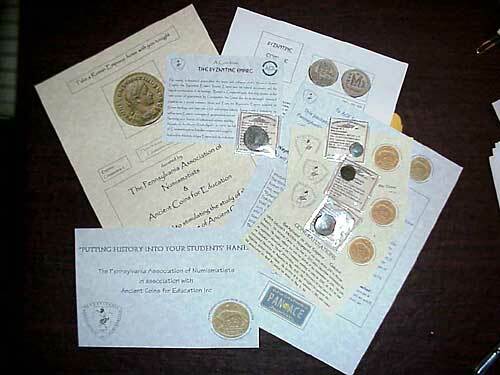 PAN is a Life Member of the American Numismatic Association. Membership is open to any individual or club interested in the study and collection of coins, currency, medals, tokens, and related material. http://www.pancoins.org/Coins4Kids/index.html Coins4Kids is PAN's coin club especially for new and young collectors of all ages. Held four times yearly at the PAN and Indiana Coin Club shows, each session features short talks about coin collecting, fun coin quizzes, a real coin auction, and lots of free coins, supplies and books. Hundreds of dollars worth of prizes are given out each time. http://www.pancoins.org/club_pan_coins4as_app.html COINS FOR A's From coins donated to it by collectors and those who want to spread a knowledge of coins in Pennsylvania, PAN will send to eligible students in Pennsylvania schools, ages 10 to 15, a coin or coins for one or more A's that are received per semester. Applications must be received no more than 60 days after you receive the report card.